Living in Calhoun County and owning a small business in Kalamazoo county, Jase is the only candidate who is personally invested in both counties of our district. He is dedicated to our state representative district all day and every night. Jase and Nick Bolger preparing for a campout. 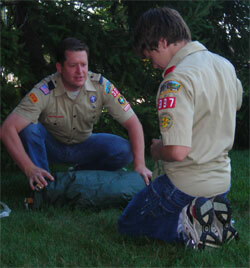 Jase earned his Eagle Scout in the Boy Scouts of America in 1986. After attending Western Michigan University together, Jase married his high school sweetheart, Molly. They'll celebrate 19 years of marriage in 2012. They moved to Calhoun County 16 years ago to start their family in Marshall where they’re raising their two children who attend Marshall High School. Jase and Molly, along with the entire family, are active at St. Mary Church, in our schools, in volunteer organizations, and a wide variety of activities in our neighborhoods. They are dedicated to our community. Jase's parents, Jim & Eileen Bolger, instilled strong values, respect for others, and community service through their words and in leading by example. They both set an example with public service: Jim as a Michigan State Police Trooper; and after raising 3 boys, Eileen served more kids as a high school secretary. After graduating from Charlotte High School, Jase & Molly attended Western Michigan University where Jase earned his Bachelor's of Business Administration. He achieved dual majors in Finance and Political Science. Jase earned a variety of experience working to pay for his own college tuition. He worked in a factory building screen doors, on the grill in fast food, and in customer service for a manufacturer and a bank. Fourteen years ago, just after his second child was born, Jase got together with a few friends and business associates to start a small business. That business updates customer data records for Fortune 100 companies throughout the country. The company has brought jobs to Michigan, jobs that otherwise wouldn’t be here. Today, they literally compete nationally and internationally to convince businesses to send their work to Michigan. Jase knows how to create jobs. He knows what it takes to start a small business and struggle to make it work; because he’s done it. I have feared losing my job due to big business consolidation. I have struggled to pay our bills, especially big medical bills and taxes. I have had to fight with government regulations and bureaucracy. I have paid soaring increases for health care coverage. I have struggled and wondered how to meet payroll, pay taxes (income taxes, payroll taxes, the county’s personal property taxes, and Michigan’s business taxes), and the accounting and legal bills to comply with various government’s requirements. Through this experience I won't look for the easy answer, I'll work for the best answer. I'll continue to stand for what is best for you and our community.